Algojammer is heavily inspired by (stolen from) the work of Bret Victor, particularly Learnable Programming (2012) and Inventing On Principle (2012), although it only incorporates some of the ideas presented. A longer list of other influences and similar projects is given in Inspiration. The project is not finished, but I am not in a position to work on it at the moment, so I am putting it out there in the hope of inspiring others to contribute, or at least provoke some interesting discussion. The left hand side of the main window is a text editor where you should write your algorithm. We refer to the contents of the Editor as "Maincode". This editor uses Ace. See this page for keybindings. By default your code is re-run immediately on any changes. Algojammer is a "time-travelling" or "omniscient" debugger, where steps of execution can be arbitrarily jumped to. There is not really any concept of "debugging" in the sense of controlling the execution of the code via breakpoints or "stepping through". The Execution of your code should be thought of as just a physical fact about the lines of text you have written. In the same way we might consider the "Number Of 'e' Characters" in the code, or the "Average Line Length" of the code, the "Execution" of the code, is just a static fact that is entirely determined by the code. Of course, while the "Number Of 'e' Characters" is a fairly simple fact - just a single integer - the Execution is quite a complicated fact. The Execution is so complicated, actually, that reasoning about and moulding the Execution into what you want is essentially the entire art and craft of programming. The features of Algojammer are designed to help you understand the Execution of your code visually, so it can be intentionally crafted, bit-by-bit, into the algorithm you want. The State of any variables at any of one of these Steps. To the right of your code editor is the Timeline, the first tool to help understand the Execution. 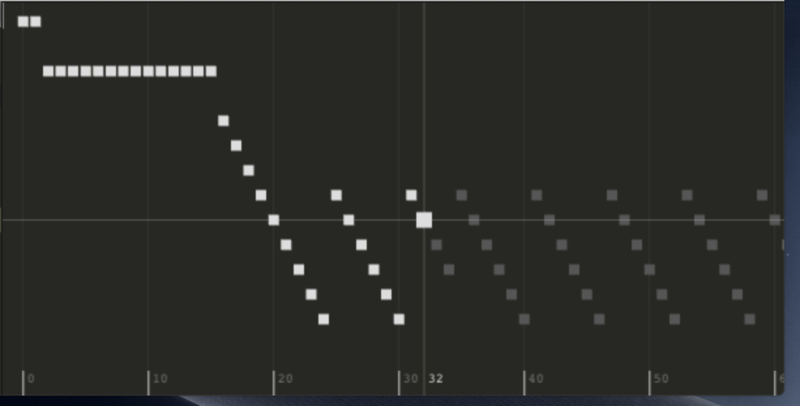 Each Step is represented by a small square on the Timeline. These squares proceed from left to right, and line up with the corresponding line of code that was executed. The Timeline can be zoomed and scrolled with the mouse, and the Current Step is highlighted. Hold shift to set the Current Step. The Timeline can give an immediate "feel" or "shape" to an algorithm by giving you some idea of how Execution is distributed across the lines. Notice in the following screenshot of a Bubble Sort algorithm, we can see that with each pass of the algorithm, the bottom two lines are executed less and less frequently. This gives us some hints that this particular sorting algorithm performs well on nearly-sorted data. Other sorting algorithms have a different "shape". In Algojammer, we can interrogate and investigate the Execution by writing Metacode. Metacode is code that we write about the Maincode's Execution. Metacode can be thought of as a reification of this sort of process. The basic idea is... we are programmers, we have chosen Python to describe our algorithm, we might as well use Python to describe the queries we have about that algorithm as well. "When is x less than y? ", "Is p ever twice as big as q at the same time that r is negative?" etc. - these types of questions are natural answered by writing code. The following screenshot is from Chronon, which is an omniscient debugger for Java. The user is adding a filter to find places where a certain condition is true (kind of like a conditional breakpoint). Things like this make me wonder if designers have lost their minds. People have got so used to interacting with computers through dialogs that they struggle to imagine anything else - even if those people are programmers, and they are programming at the time! To be clear, Chronon is an absolutely phenomenal product (way better than this project! ), but this dialog genuinely reminded me of those intentionally terrible UIs for entering phone numbers that were a meme a while ago. Metacode neatly replaces this kind of clumsiness. In normal programming environments, the distinction between Maincode and Metacode is not explicit. Usually, Metacode, such as print statements or logging, is mixed directly in with Maincode. For some queries we might have, this is not too bad, but for more advanced queries that incorporate questions about, say, how data mutates across time, you might have to actually refactor your code to log the data you want. Explicitly separate Metacode - with an omniscient view of the entire Execution - avoids this issue entirely. The output of Metacode generally goes on Sheets. Conceptually, Sheets should be thought of like scraps of paper - messy, temporary aids to help with comprehension. They are not part of your algorithm and would normally be discarded as soon as they have achieved their goal, which is greater understanding. Sheets perform the role that is covered in normal IDEs by watch windows and the debug console, but with the added advantage of being able to output both text and pictures. To add an output to a Sheet, right click the Sheet and select 'Add'. To edit that output's Metacode, right click it and select 'Edit'. In a Metacode editor, any variables that are in scope in Maincode at the Current Step will automatically be in scope, with their values set to whatever they were on that Step. This is why in the above examples, the Metacode can just refer to X, a Maincode variable, and also why the picture changes as we scrub through. There's nothing to stop you overriding these values but it won't have any effect outside of that code snippet (remember - Execution is just a static fact!). On top of this, Metacode is completely omniscient. You also have access to a special variable jam, that can be thought of like a Swiss army knife for interrogating the Execution. For example jam.state(100) will return a state object for Step #100. So, we can calculate things like jam.state(1000).x - jam.state(2000).x - the change in the value of x between Step #1000 and Step #2000. We can also query things like jam.visits(6) - an array that tells us every Step that executed Line #6, or jam.line(250) - the Line that was executed on Step #250. 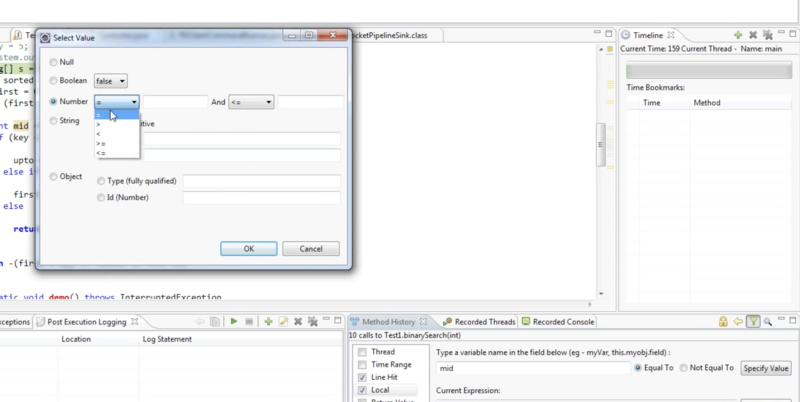 Eventually more 'tools' will be added to the jam object such as the ability to query the callstack. Apart from Sheets, the only other place that Metacode can output information is to the Timeline in the form of Markers. Markers are basically the closest Algojammer equivalent to breakpoints. Markers appear on the Timeline as vertical coloured lines, and should be used to show where in the Execution certain conditions are true. Markers are stored in the dictionary jam.markers, which can be read from any Metacode editor, but only written to from the special Marker Editor. You can open the Marker Editor by right clicking the Timeline. Only 100 Markers can be set at one time (this is for performance reasons, it's not a design choice). A quick demo is available on YouTube. - The current implementation of Algojammer is extremely hacky and brittle. Currently Algojammer uses Eel for the GUI, which means you need Chrome or Chromium installed. The Execution is recorded using a C++ extension that requires a C++11 compiler to build. Algojammer is only tested on Python 3.5, and due to the very hacky nature in which it is currently implemented, probably doesn't work on many other versions. A criticism that is sometimes levelled at Bret Victor's (or Chris Grainger's) work is that the demos feel revolutionary but essentially solve "toy problems", and start to creak when you think how they might scale to "real programming". I think this is important because it attaches a certain degree of falsifiability to some of the navel-gazing, pretentious nonsense I've written above. Ultimately, when the clock's ticking in Code Jam, and I just really need to solve this problem, do I reach for a tool like Algojammer? This test can't be faked. An actual "bicycle for the mind", is not something that feels revolutionary in a conference talk. An actual bicycle is something that let's me easily beat people who are better than me in a race. So, this is the current goal for the project: to build a tool that has a provably positive effect on people's performance in Code Jam. Unfortunately I have reached the limits of my enthusiasm, ability and ideas at the moment, so I am putting it out slightly early in the hopes that other people can help, or at least to stimulate some interesting discussion. Please use the Issues for starting discussions on ideas you might have for either design, or engineering. It doesn't have to be related to Python or Algorithms. I am not interested in actual issues in this actual codebase - this is a demo/prototype. JIVE - an omniscient debugger for Java with visualisations and query based debugging, seems to be a research project of University of Buffalo. 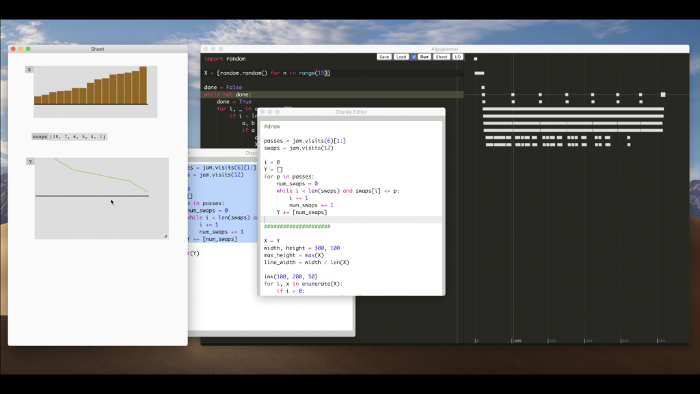 Light Table - "next generation code editor" by Chris Grainger. See also What Does Programming Look Like In 10 Years? and Toward a better programming for more advanced ideas. ldb - A reverse debugger written as part of Abraham Coetzee's Masters thesis "Combining reverse debugging and live programming towards visual thinking in computer programming". The thesis is full of great insights and gives a great summary of other work. Chronon - a very professional omniscient debugger for Java ("a DVR for Java"). ODB - Omniscient Debugger, for Java from 2007, by Bil Lewis. I think this coined the term "omniscient debugger". There are many other projects out there such as RevPDB (a reversible debugger for Python from the Pypy team) and Undo (reversible debugger for C++), but I haven't looked into them in detail.